A nice burger when you’re a little hungover or haven’t gotten enough sleep is the perfect meal to usher you into your midday nap. At least, that was my plan as I walked over to University Commons Plaza, right across from Wilfrid Laurier University. Ironically, the first ever CaliBurger in Canada has taken the place of what was formerly “Runner’s Choice,” a symbolic reminder I’d spent more time on the north side of University and King eating rather than in the gym running. Snapping me out of my contemplation, I was welcomed by a manager who immediately started telling me about the CaliBurger franchise. Aware of the demographic around University and King, Caliburger’s marketers reached out to The Advertising Project, Lazaridis Students’ Society’s student-run advertising club, to assist in developing promotional material for their opening. The club had experience dealing with small business and non-profits, but they were excited to work with a larger franchise. I sat down with Ryan Price, vice-president of accounts at The Advertisement Project and the main contact with the marketing group for CaliBurger. “They thought, which I agree with, that the best way to reach students is through other students,” said Price. A logical move that made me wonder why other restaurants hadn’t done the same thing. “To be honest, I think companies either don’t believe in the capabilities of students or that something like The Advertisement Project even exists. I think a lot of companies forget that they’re around two universities that have thousands and thousands of students,” said Price. The partnership is intended to be beneficial for both sides. CaliBurger will get The Advertisement Project’s expertise free of charge, while members of the club receive valuable experience and the opportunity to help the community. While in CaliBurger, I took a look at what they could offer the Laurier demographic. What stuck out was their emphasis on technology. 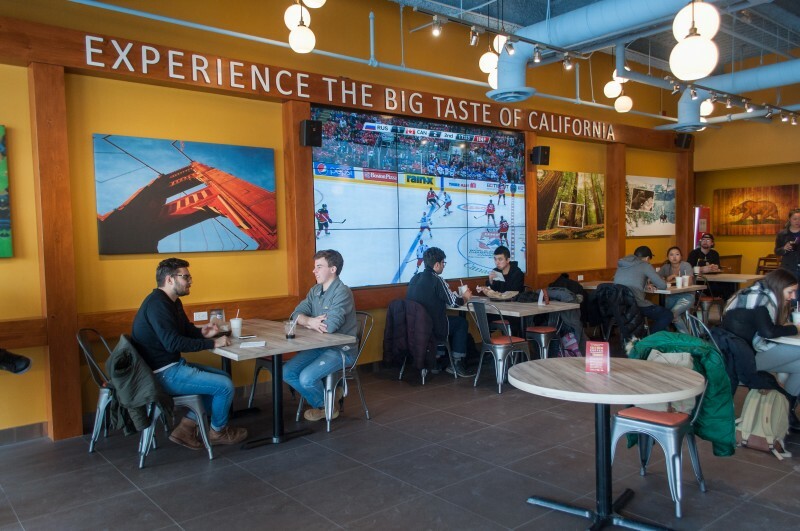 By downloading the CaliBurger smartphone application, you’re able to play games and compete with other customers on a massive television screen. Yet, the University Commons location does a good job of balancing out all the electronics. A spacious layout invites eaters to dine in and the light-brown wood table offsets all the electronic screens. In terms of the food itself, CaliBurger knows that it’s a fast food burger spot and doesn’t pretend not to be. They don’t offer insane twists nor do they provide many healthy alternatives. The menu is straightforward, with four highlighted combos. I rolled with the first one — the CaliDouble. 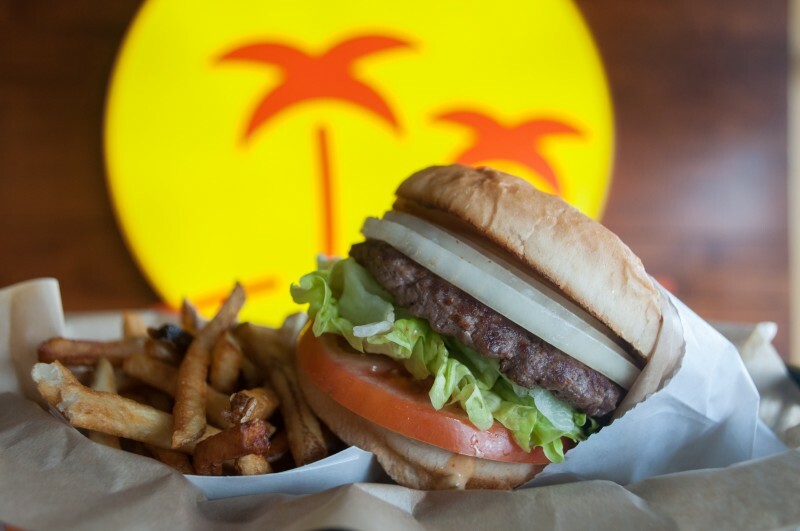 My CaliDouble featured two juicy patties resting on a satisfying amount of fresh lettuce and tomatoes. Yet, it’s the nuances that made it above average. The “Cali Sauce” was tasty and didn’t overwhelm the meat, my personal favorite touch was an onion cushioned between the patties, ensuring I got all the flavors with every bite. Extra points for a burger that ensures the last bite has everything you tasted in your first bite. CaliBurger serves long and skinny fries that aren’t spectacular. In order to add some flare, they offer them in “Cali Style,” which includes a couple slices of cheese and grilled onions on top. The main attraction is definitely the burger, albeit, at the price of around $14 for a combo. Overall, the whole dine-in experience was satisfying. Fueled by the anticipation of their opening, the managers and employees were talking to everybody at the event trying to get feedback. They seemed to understand that in the food business, first impressions are everything. Author: Alex DulanovicAlex Dulanovic is a fourth year English student that started focusing on school and writing a little too late. A self-proclaimed music and basketball nerd, he's suspicious that the meaning of life can be found somewhere between reading a great book and going out with friends.